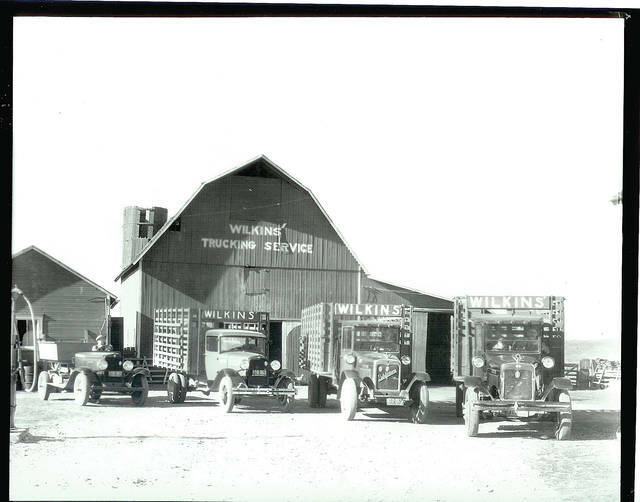 This commercial photograph of the Wilkins Trucking Service shows a fleet of trucks ready to work. KENNARD — This is a photo (#0483) of the fleet of trucks of the Wilkins Trucking Service of Kennard, Ohio. The trucks have Ohio 1930 license plates. Note the large motormeters on the radiators of the two trucks on the right of the photo. Motormeters were devices that indicated the temperature of the coolant. Drivers are in every truck except the second from the left. Diagonally across the radiator of the second truck from the right is spelled Bellefontaine. It is not clear what this signifies. The truck to the far left appears to be a dump truck while the others are livestock trucks. This is commercial photograph taken by William Whitham who was a commercial photographer in Champaign County during the 1920s, 1930s and 1940s. As we have no information about the trucking service, we would appreciate information about it including owner’s name and location of the business and other information relevant to the photo. Also, information about the trucks (year, make, model etc.) would be appreciated. https://www.urbanacitizen.com/wp-content/uploads/sites/36/2018/10/web1_Looking-Back-Wilkins-Trucking-Service.jpgThis commercial photograph of the Wilkins Trucking Service shows a fleet of trucks ready to work. Photos courtesy of the Champaign County Historical Society.